Recording field potentials was the first form of electrophysiology I ever did, and because of that, I tend to think that field potentials are simple. But the reality is far different. Field potentials, in my view, are harder to gain a solid understanding of than intracellular membrane potentials. So I’m going to try to take a ‘first principles’ approach to thinking about field potentials. To motivate us, I’m going to present exhibit ‘A': The hippocampal CA1 population spike. Exhibit A: A CA1 population spike. Recorded by me in 2004. A CA1 population spike is the field potential recorded near the cell bodies of the CA1 pyramidal cells, when their afferents are stimulated strongly enough to cause the CA1 cells to spike. You see a brief upward deflection, which is an artefact from the electrical stimulation used to activate the afferents. 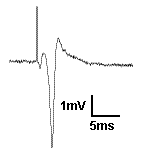 Then you see a small downward deflection, which is due to the action potential in the afferent fibers. Then you see the population spike: the large, brief, negative potential caused by thousands of neurons spiking synchronously. It is negative because when the action potential is generated, Na+ moves into the cell, making the extracellular space negative. But here is a question: Why does the population spike appear to be resting on a positive going hump? Read on and find out, and learn more about field potentials in general. Typical electrical model of the cell. Where you have a conductance of a give ion channel X ( ) that has a reversal potential ( ) and these produce currents that charge up the membrane capacitor ( ). We literally HAVE to make the model more complex to even generate a field potential, but before we do, we’re going to simplify matters. 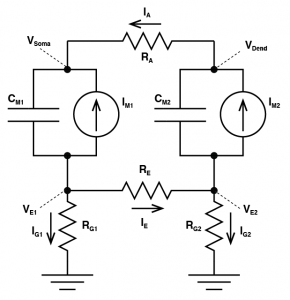 We know those conductances create a current, which is explained with the equation: . The different currents add up linearly, giving us a total ionic current. 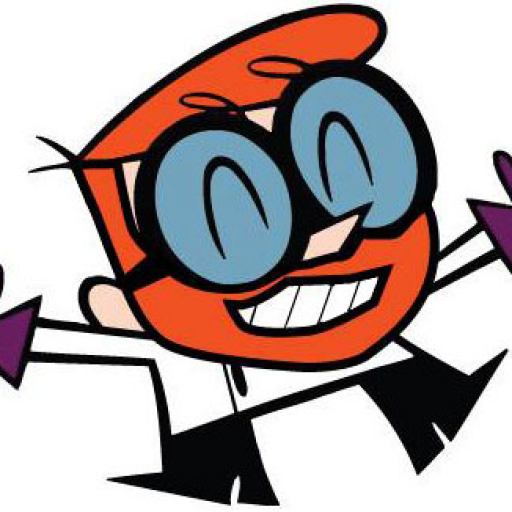 So let’s just scrap all of these reversal potentials and conductances, and treat them as a current source. (Personally, I think this is a better way to get an intuitive understanding of membrane biophysics anyway. Membrane resistors cause people lots of confusion). This gives us a simpler looking model. This is a very good way to think about cells. But it is a single “compartment”. That is to say our entire cell always has the exact same membrane potential throughout space. This is, of course, not accurate for most neurons, and more importantly, if a cell truly behaved like this, we would not get field potentials. In order to get field potentials, we need to add a second compartment. Now don’t get scared! 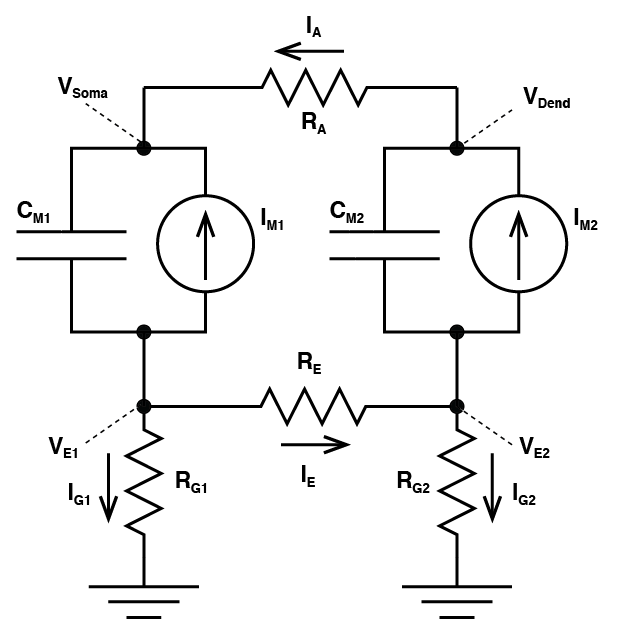 This is just two single compartment models, where the intracellular side is joined by a single axial resistor . The outside of each compartment is connected to ground by a resistor and . And finally, the outside of each compartment is connected via an extracellular resistor . Let’s imagine glutamate is released onto the dendrite, which causes AMPA channels to open. 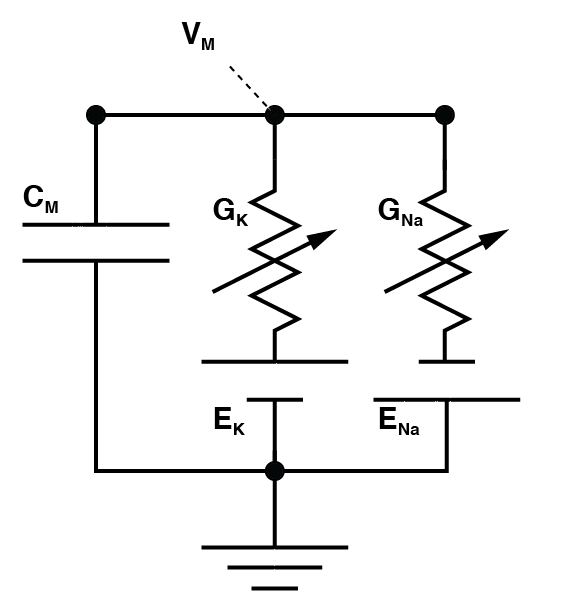 This causes an increase in which begins to charge the local capacitor . This causes the local voltage in the dendrite to increase (i.e. we have an EPSP). Now there is a difference in voltage between and and this causes current to flow down the dendrite to the soma (i.e. grows from zero). Now we need to consider a fundamental rule of electricity: Any current that flows into something must always flow out of it too. What this means is the axial current is equal to the sum of the currents and the current that flows through the capacitor . So we know their must be current flowing into the part of the circuit called and because of that, the voltage at must be growing. If is non-zero, then the current must also be non-zero. And there is our field potential! We need to complete matters though: We started with the idea that an EPSP was occurring in the dendrite, due to an increase in . That current must have come from somewhere, and it is equal to the sum of , and the opposite of the current flowing through (if that confuses you, just consider all the currents flowing into the the part marked and know that they must add to zero). Of course, as soon as is non zero, then we must have a voltage forming over and now we have a field potential occurring at . Now that may have been a little complex. I urge you to draw the circuit yourself, and follow how the current and voltages form, however, we can make it even simpler. Let’s just explain it with words. If an EPSP forms locally, current must flow from where the membrane potential is more depolarized, to the rest of the cell, that is we get axial current. Because of the rule that the current flowing into a compartment must be equal to the current flowing out of it, when current flows into the second compartment, it must flow out of it. 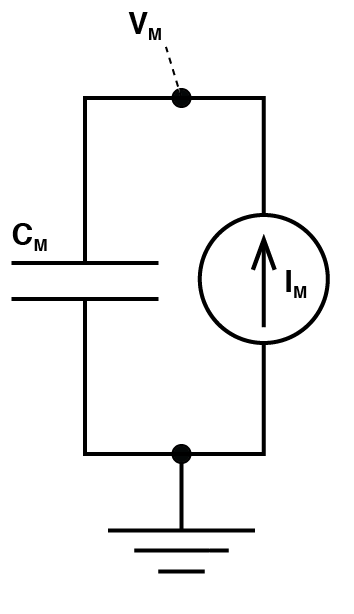 In a two compartment model, this means all axial current flows out into the extracellular space. Some of this current must flow back to the extracellular space where the EPSP formed initially, and some must flow to ground. The current that flowed to ground creates a positive field potential outside the second compartment. Because some of the current flowed to ground, then the current that flowed back to the extracellular space outside of where the EPSP formed is not equal to what flowed into the cell to begin with, hence some current must flow from ground to that site, to make up the difference. 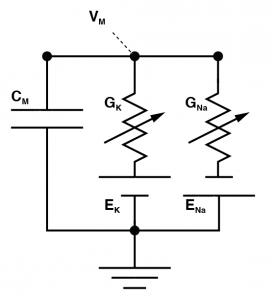 This creates a negative voltage, relative to ground. This concept, expanded across multiple compartments is what gives rise to “current sources” and “current sinks”, and is fully explored in “current source density experiments”. The current sink is where positive charge moves into the cell (e.g. the site of an EPSP) and a current source is where the positive charge moves out of the cell. Now we can see what is going on: Any current that flows into one compartment ( ) must come out of the other (i.e. ). Now, the charges that make up must come from somewhere, and the current must go some where, so will be non zero. This will cause a voltage drop over meaning that the voltage must be greater than zero. 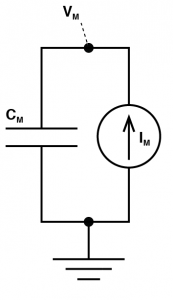 This means current will flow between ground and (i.e. is not zero). Now is the sum of and , and we know is equal to , then this tells us that must be equal and opposite to (i.e. the difference between and must go somewhere, and it goes to ground). Again, go through it yourself and you’ll see that this must be the case. Now, this is only a two compartment model, so it will never accurately represent the complex field potentials seen in real neural tissue. But it DOES give you the fundamental insight: all current that flows into a cell must flow out of the cell at some point in space. This current then flows back to where the current moved into the cell. This extracellular current flow gives rise to the local field potential. These same ideas explain why the local field potential and EEG usually go in opposite directions and even why the signals of a multi-lead ECG look different from lead to lead.